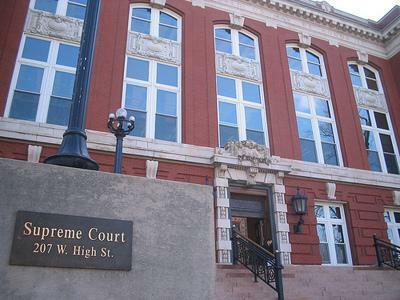 The Missouri Supreme Court building in Jefferson City, Mo. One day after Governor Jay Nixon (D) made his State of the State Address, the annual State of the Judiciary Address was delivered to Missouri lawmakers today. Chief Justice Rick Teitelman kept his speech short, but did call for the General Assembly to pass changes to the state’s probation and parole system in order to ease Missouri’s prison population. The changes could save the state as much as $16.6 million over five years and reduce the state prison population by about two percent. A state work group that included two judges made the recommendations in December. It was Teitelman’s first address since becoming Chief Justice of the Missouri Supreme Court last summer. He also praised court employees from across the state who took time off to aid in relief efforts in Joplin following last year’s devastating tornado. He did not address the court's recent decision to strike down a map of new state Senate districts just weeks before candidates are to begin filing for office.